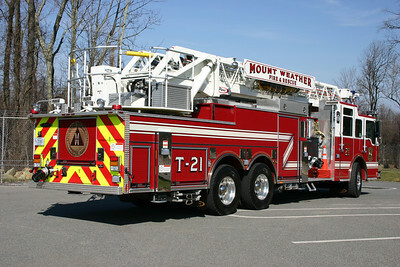 Station 21 is the Mount Weather Fire Department and operates atop of the mountain that borders Loudoun and Clarke counties (accessible via Route 7 or Route 50). Station 21 units operate within this highly secured facility. 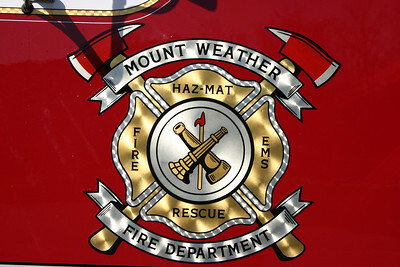 Although not affiliated with Loudoun County, Mount Weather units will come off the mountain where they frequently run mutual aide with both Loudoun County and Clarke County as "21" units. Mt. Weather's Engine 21 received this 2014 Pierce Velocity Puc equipped with a 1500/920/30A/50B. Note the remote nozzle mounted on the front bumper. Engine 21 was photographed at the 2015 Apple Blossom Festival in Winchester, Virginia in May of 2015. 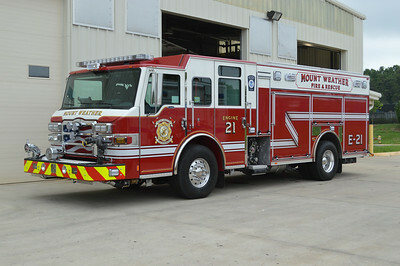 Mount Weathers newest is Engine 21. A 2014 Pierce Velocity PUC, this photo was taken at the local dealership in Manassas, VA.
Two Pierce fire trucks were delivered in 2004 and operate as Engine 21 and HAZMAT 21. Engine 21 is a KenWorth T300 built by Pierce and equipped with a 1250/1000. 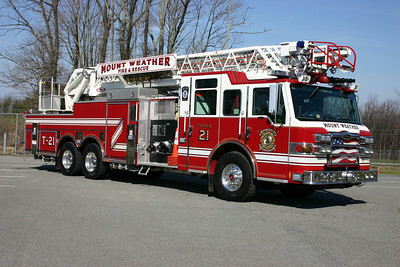 Engine 21 was photographed in the visitors center parking lot of Mount Weather. 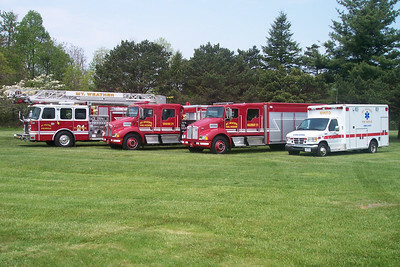 The September/October 2010 edition of Fire Apparatus Journal published a profile of the apparatus in service at Mount Weather. 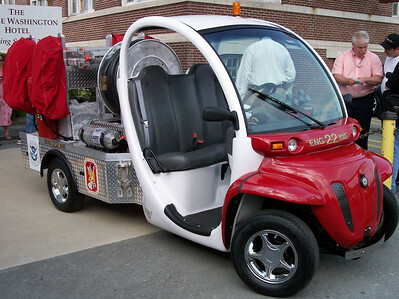 This unusual 2003 Chrysler Global Electric Motorcar is one of two operating at Mount Weather in undisclosed areas. 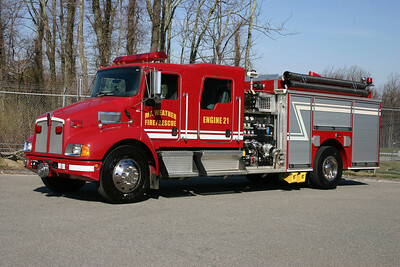 Engine 22 is equipped as a fire unit, and the other Chrysler is a EMS unit. 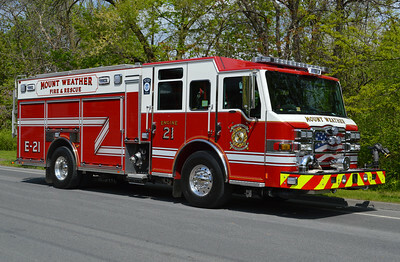 This rarely seen Engine 22 was photographed at Apple Blossom in Winchester. 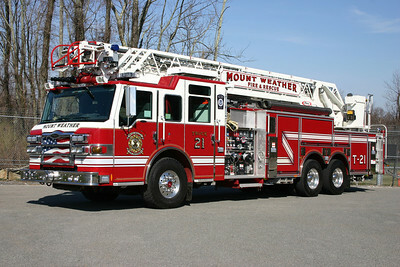 Truck 21 at Mount Weather is this impressive 2009 Pierce Velocity equipped with a 105' rearmount and a 2000/500. In addition, the truck carries 100 gallons of foam and is a primary stand by piece for the numerous helicopter landings that occur on Mount Weather. The officer side of Truck 21, as photographed in the visitors center of Mount Weather. The back end view of Truck 21. 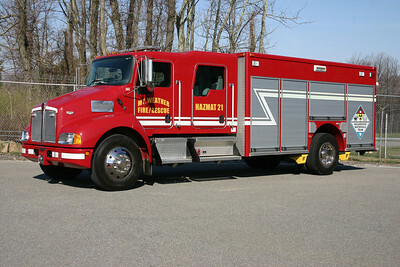 HAZMAT 21, delivered together with Engine 21, is a 2004 KenWorth T300/Pierce. 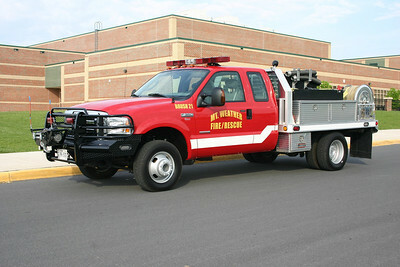 Brush 21 is a 2006 Ford F350/Shade Equipment and equipped with a 350/250. Photographed at the 2006 Apple Blossom Festival firefighters parade held in Winchester. Mt. Weather, VA - FEMA complex. 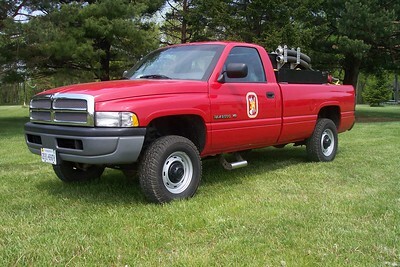 Medic 21 is this 2014 Dodge 4x4/2015 PL Custom Classic. This facility runs mutual aide into a variety of areas, including Loudoun, Clarke, and Fauquier counties in Virginia and Jefferson County, West Virginia. 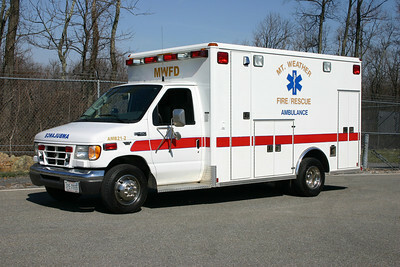 One of two similar ambulance run by Mount Weather. 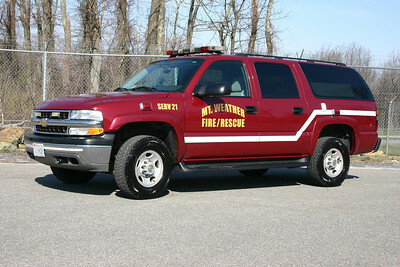 SERV 21 (Special Emergency Response Vehicle) is a 2004 Chevrolet Suburban outfitted by FastLane. 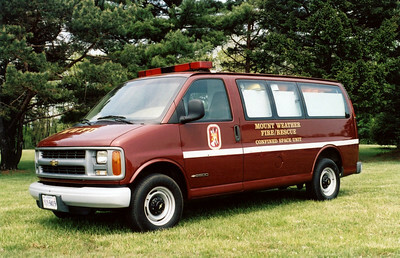 Mount Weather's Confined Space Unit is this 1999 Chevrolet van. 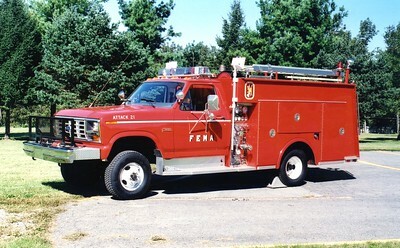 Former Wagon 21, a 1986 Pierce Arrow 4x4, 1250/750/60, sn- E3293. Given to Singer Fire Apparatus as a loaner. 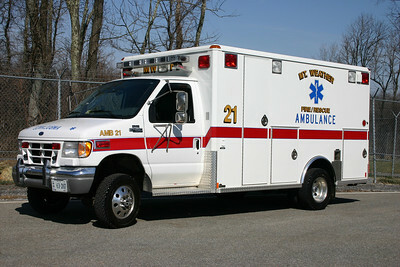 Old Truck 21, also photographed at Apple Blossom, was a 2002 E-One Cyclone II 75' rearmount and equipped with a 2000/500/40. 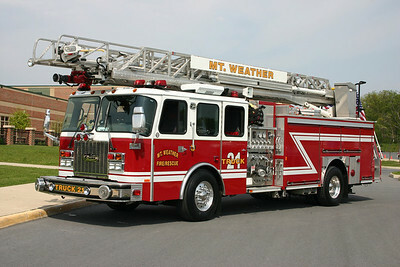 Mount Weather's ladder trucks can operate as engine companies in the event that Engine 21 is out of service. 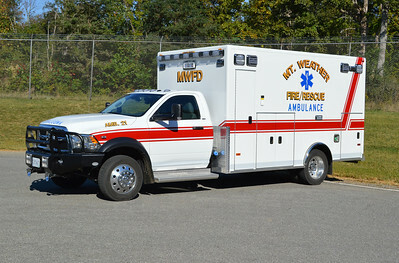 After service at Mount Weather, this truck went to a FEMA facility in Plum Island, New York. 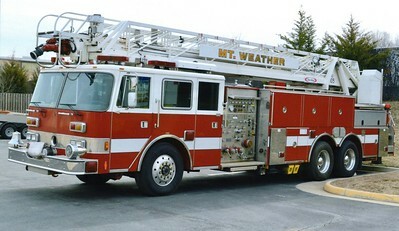 Mount Weather's former 1990 Pierce Arrow/2003 Pierce, 1000/300/30, 105', sn- E5935-03 ladder truck. 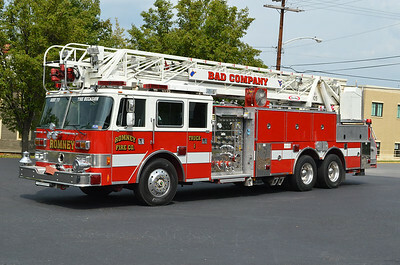 ex - Fort Meade, Maryland, Truck 63. Ex 21-1 is a 2001 Ford E450 built by Wheeled Coach. Replaced by the newer Dodge. Former 21-2 is a 2003 Ford E450, also built by Wheeled Coach. A group photo of Mount Weather apparatus as photographed in 2005. Romney Truck 1 was originally delivered to Ft. Meade, Maryland where it was painted lime green and white. It was one of five delivered. 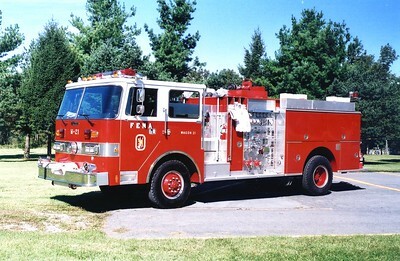 1991 Pierce Arrow 105' 1000/300/30 and rehabbed by Pierce in 2003, where it was painted red and white (E-5935-03 with rehab number F-5021). It also served at Mt. Weather, Virginia. Sold to Romney, WV in September of 2014. Roto Ray added shortly after being placed into service. 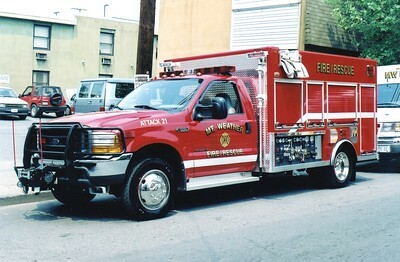 Former Attack 21, a unique 2000 Ford F-550/Fire Attacker, 300/200. Wrecked in 2003. Former Attack 21 from Mt. Weather, a 1985 Ford F-350 4x4/LTI, 300/200/20. 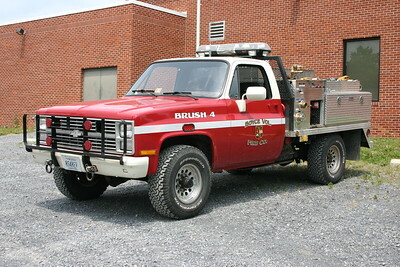 Former Brush 21, a 1985 Chevrolet/2001 FD, 350/200. Sold to Boyce, Virginia (Clarke County). 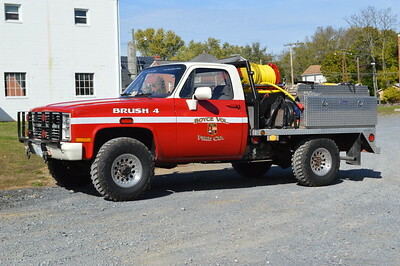 Brush 4 with its former skid-unit. 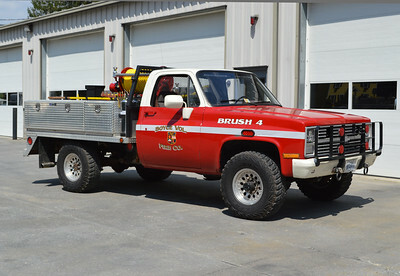 Brush 4 from Boyce is this 1984 Chevrolet Custom Deluxe/2016 Wildland Warehouse/2016 FD. 95/200/10. Ex- Mt. Weather, VA.
Boyce, Virginia Brush 4 received an upgrade in 2016 with the addition of a new skid unit. 1984 Chevrolet Custom Deluxe/2016 Wildland Warehouse/FD. 95/200/10. Ex - Mt. 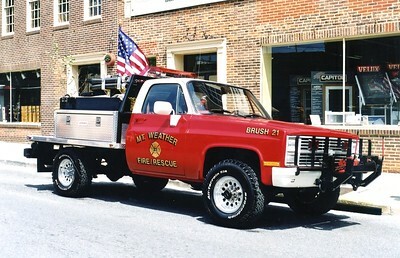 Weather, VA.
Former Brush 21, a Dodge Ram 2500.